This unit is the freestanding soldier of the Continuum Rig System army. Far from a discount pull-up rack, the Continuum Quarter Cage/Squat Stand features the same uprights as our Performance Series line of cages. That means that Performance Series cage accessories will work with the 3904 just as well as our Performance Series Half Cage, such as landmines, step and dip attachments. 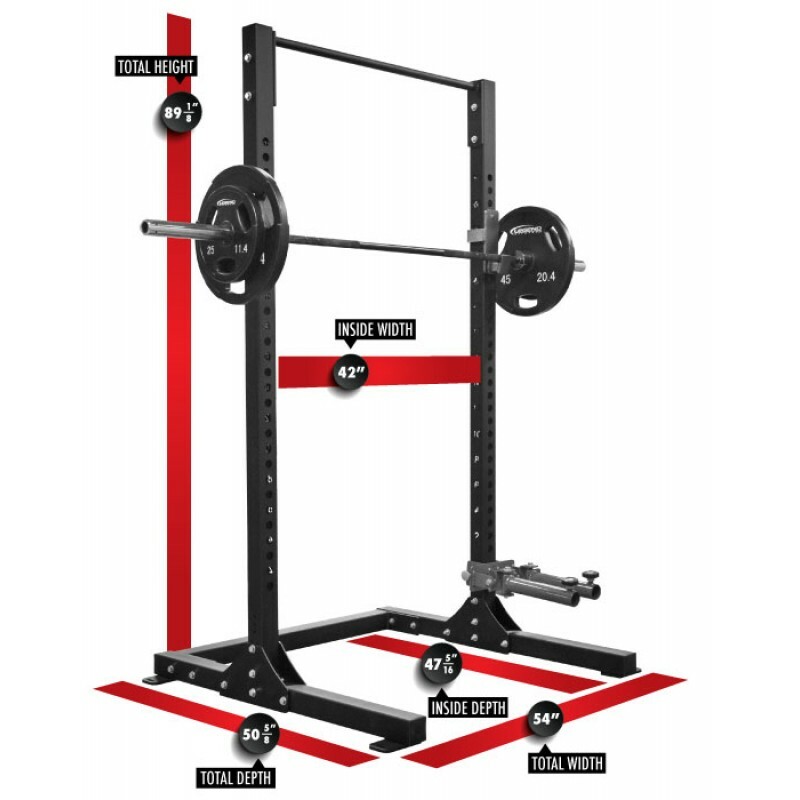 In fact, you could be forgiven for thinking of the Continuum Quarter Cage/Squat Stand as a half cage but without plate storage. To ensure that things remain stable with only two uprights, our design team developed huge 3/16-inch thick buttresses secured with no fewer than five case-hardened bolts over post flanges secured with two additional bolts. If that’s not enough, the 3904 can be bolted to other cages using the Continuum Connectors to create a line or jungle of connected cages, providing shared rigidity, more pull-up stations, or additional suspension training areas. The easily assembled design allows for boxed shipment, which makes this our only cage that is a stocked item which can be shipped in 1-2 weeks with fixed freight cost on single unit orders. Accepts most Performance Series cage accessories (see all the accessory options here). Can be linked to other cages via Continuum Connectors. Stocked item, ships in 1-2 weeks. NOTE: Insert platforms are not compatible with this cage. The feet at the bottom of our Continuum uprights were modified to be wider for better stability. This change may not be reflected in all photos. All Continuum uprights, with the exception of the Quarter Cage/Squat Stand, must be bolted to the floor prior to use.